Same package as the TEXPEN but larger capacity. 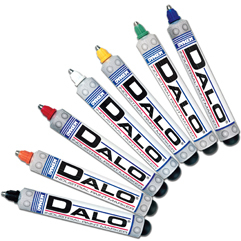 Dalo Markers feature a long-lasting stainless steel tip for writing on rough surfaces and pressure bulb that enables you to write at all angles, even upside down. Write through grease, oil, and even underwater. 7 Colors and 3 Tip Sizes, Extreme Duty, Write Thru Water and Oil. Click Here For Instructional Video Link. Nice marker! Write on anything. Dries take a long time but handstyles would look sick. there are very good...thick paint and writes on difficult all textures at all angles. just make sure to clean the tip after use or it can get clogged open and thats not a shirt pocket you want to find!